We were invited to join The Electrician’s grandparents for Sunday night dinner this past weekend. As she often does, his grandmother went to town on the meal and made a fabulous roast with all the trimmings. I don’t know how she does it, but that little woman makes the best beef gravy I’ve ever had. Sorry, momma. After dinner, we somehow found room for bread pudding and ice cream. Standard Sunday dinner procedures include The Electrician taking enough leftovers for a lunch or two during the work week. Since there were no mashed potatoes left following Sunday’s meal, The Electrican just packed enough slabs of beef into a ziploc baggie for a few sandwiches. Back at the dollhouse, I made him some mashed potatoes to go with the meat so he could have a hot noon meal. Mashed potatoes and gravy are his favorite thing, after blueberry custard pie. I also had a package of gravy mix crumpled at the back of my spice shelf in the cupboard above my stove, so the man was lucky indeed. As a general rule, I don’t use instant mixes. I grew up cooking from scratch and I’m a bit of a kitchen purist in many ways. By the time I got home Sunday, it was late enough that I was willing to swallow my pride and just microwave some gravy. My Pyrex measuring cup (the mid-size one, not the big honker) had the perfect depth for the cup of tap water called for in the package directions. I know better than to overfill something going into the microwave, so I made sure the soon-to-be gravy only took up the bottom half of the measuring cup. It didn’t take long at all the whisk the lumps out of the swampy (yet alarmingly meat-scented) liquid. The instructions said to microwave for 3-4 minutes, stirring halfway through. I cooked it for two minutes and whisked it again. At this point, The Electrician popped into the kitchen to comment about how good things smelled. I set it to cook another ninety seconds, pushed “start,” and went back to washing dishes. 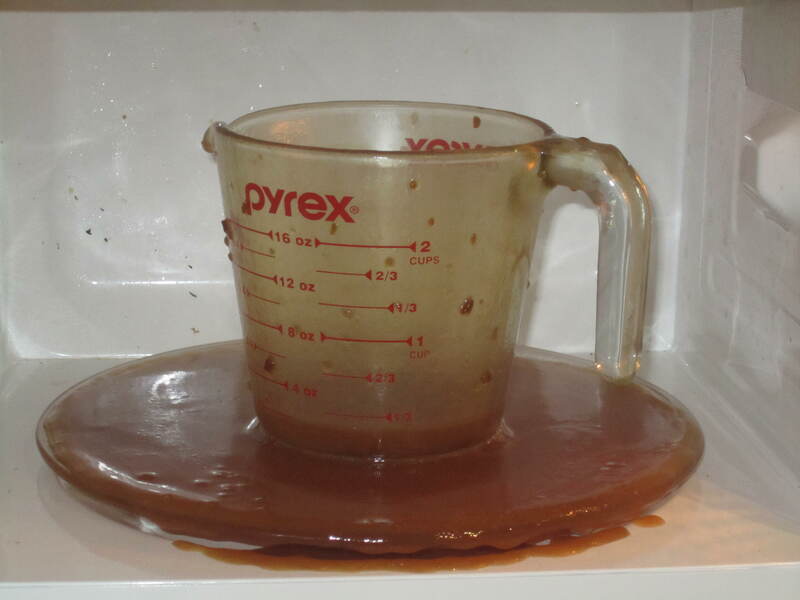 When the microwaved chimed to indicate it was finished, I left it for a few minutes so the gravy could stand and thicken, and to avoid hauling a smokin’ hot piece of glassware out. My hands have been particularly numb and clumsy this week, so I’m trying to not take unnecessary risks with things that could hurt me. When I finally opened the microwave door to retrieve my gravy, I dropped my pot holder. Something very, very bad took place in my microwave. It may be one of the signs of the apocalypse. I’m not sure exactly what went down with the door closed and light on in my microwave. I heard no sound, and no explosion shook the dollhouse kitchen. Somehow, a beef tsunami took place while I was scrubbing cutlery. As the photo clearly demonstrates, almost no gravy was left in the measuring cup. The surviving quantity was less than a quarter cup, conveniently measured by the goopy glassware. Yes, friends, that means well over three quarters of a cup of instant thickened gravy was nuked onto the turntable plate of my microwave. Factor in the fact that I let it stand for a few minutes at the end of the cooking time, and I was left, sadly, with gravy stiff enough to fold origami cranes. The worst part of all this, besides the scrubbing that resulted from this quasi-culinary trainwreck? I’m afraid my father is right: microwaves just ruin food and instant gravy is sacrilege. The microwave still has a bit of a burnt meat smell to it. Double yuck.